While a number of big-name brands like Amazon, Google and eBay are testing the waters of local delivery on demand, where couriers drop off products following the push of a button on your smartphone, a new San Francisco-area startup called myDoorman is trying to solve the more everyday annoyance of missing your UPS or FedEx delivery window. Instead of returning home to find a sticky note left on your door, you can use myDoorman’s mobile app instead to schedule evening deliveries of your packages on demand. The company was founded by Zander Adell, previously a Technical Director at Pixar, who helped work on design and coding for films like Toy Story 3 and Wall-E. He later followed his interest in video gaming to a product management role Idle Games, but still felt unfulfilled. What really grabbed his attention, though, was Uber. He realized that he could just build the service he wanted himself, and myDoorman was born. The app began as a rough beta in March, then only a text messaging app which allowed the team, including co-founder Kapil Israni, to iterate on the product’s development. Over the past ten or so months, the company operated in a soft launch phase, where a small number of drivers would pick up packages from the myDoorman depot, and deliver them around the city. Now, the company is ready to scale up, and is beginning to receive some corporate interest as well. For example, software company Pivotal Labs is now officially suggesting to its employees that they send their packages to myDoorman, says Adell. Using the service is simple. 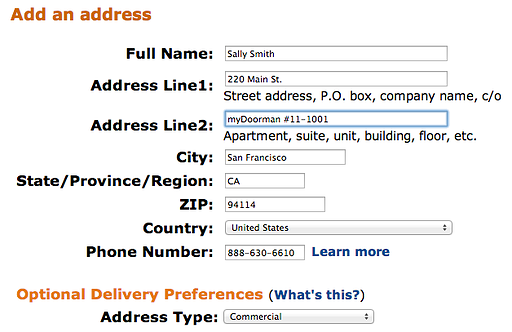 To begin, you first provide the site you’re buying from with your myDoorman address (the depot location with a unique identifier to locate the individual user’s mailbox). When the package arrives, you’re alerted and can schedule your delivery window. MyDoorman is targeting its services to customers who work all day and want to take their deliveries at home, instead of having them sent to the office, for example – something which can be difficult to manage when involving larger items, or other things you can’t carry well on your bike or on public transport. MyDoorman will also hold your packages for up to six weeks at its depot, in case you’re away. The delivery hours you pick are from 6 pm to midnight, and you’re only charged once ($7) per drop off, no matter how many packages are included. A promotion has been allowing for free deliveries, provided you tweet about the service. Similar to Uber, myDoorman’s drivers are contractors, allowing the startup to keep things lean initially. Its first “depot” is an independently owned mailbox shop, where myDoorman rents boxes. Currently, the service works across all 25 zip codes in San Francisco, but if things go well, it could see expansions into neighboring cities and other urban metro areas over the course of the year. The company has been bootstrapping, but is now joining the 500 Startups program which gives it some start-up capital work with. And in three weeks, myDoorman will launch an updated, polished version of its mobile app which Adell describes as being much “slicker” than the test version live in the App Store today. (Pictured is the interface of the new app). Over time, the company could also move into local deliveries, similar to what the big guys and others like Instacart are doing, but the focus for now is on fixing the problem with missed deliveries, says Adell. “What’s interesting about Google Shopping Express, eBay Now, Amazon Fresh, and Instacart is this idea that you want [a product] instantly but it’s very dependent on the product that you want being locally sourceable,” he explains. “What we do that’s quite different is that we handle anything that isn’t available and has to be shipped in a box…there will always be a very large market for stuff you want that isn’t within 20 miles of your house,” notes Adell. To some extent, myDoorman competes with those offering “locker services” for deliveries. That’s something Amazon tested with Amazon Lockers, alongside BufferBox (acquired by Google) and newer Y Combinator grad Swapbox, as well. These entrants in the space highlight the problem to be solved, but the question now is whether enough consumers will be willing to pay the additional fee to have more control over their delivery window with myDoorman, and how well its model can scale. The myDoorman apps are available here on iTunes and Google Play.